Women continue to be seriously underrepresented in leadership positions in academia and the sciences. Only 21% of the professorships with the highest endowments are held by women throughout the EU; in some countries, for instance in Germany, the proportion is even smaller (18%). The numbers are similar for important committees and commissions that decide on research awards, professor appointments and research funding. Nowadays, there is a consensus in politics and academia that the small number of women in leadership positions represents an untapped potential. There is a lack of appropriate tools, though, for quickly finding women academics who are suitable and very good. The Robert Bosch Stiftung and Spektrum der Wissenschaft hope to provide just such a tool with AcademiaNet. By providing numerous profiles of excellent women academics from every discipline, we are making them more visible and more easily accessible. This in turn will make it easier to fill leadership positions and scientific bodies with women academics. Other target groups include journalists and conference organisers searching for proven experts. The portal was established in 2010 with the profiles of primarily German-speaking women academics. Since 2012, the portal has been gradually internationalised in order to continuously expand the pool of outstanding women academics in Germany and beyond and to make it more readily accessible. The profiles of renowned European women academics have been added since 2012. In order to ensure that the database is also accessible to non-German speaking academics and users and that European scientific communities will be able to familiarise themselves with it, the web site is also available in English. The portal has been established as a European database for those searching for suitable female candidates for influential academic and scientific positions. Our established partners from the business and scientific communities vouch for the outstanding qualifications of the women academics and scientists in AcademiaNet. It is not possible to apply directly to be added to the database. Our partners appointed high-ranking persons to the steering committee, which then agreed on a set of standards for all of the partners to use when nominating candidates for AcademiaNet. The selection criteria unite the outstanding scientific qualifications, academic credentials and independent leadership activities of the nominated academics, as well as further supporting criteria. Click here for a detailed description of the selection criteria. Each of the outstanding academics nominated by our partners must explicitly agree to participate in AcademiaNet and to have her information published online. For this reason, it is possible that prominent academics have been nominated to AcademiaNet but have decided (for the time being) not to be visible in the portal. In the last years, our database has grown considerably: now you will find the profiles of more than 2700 excellent female researchers from all parts of Europe, and beyond. In 2014, the Robert Bosch Stiftung (foundation) published the brochure "No more excuses! ", meaning that there are no more excuses not to invite female keynote speakers to a conference, for instance, because nobody can claim "I didn't know there were female researchers in this field" anymore. 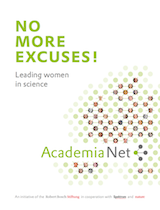 Please download this latest brochure here and read more about female experts in Europe, and about AcademiaNet.